Looking upon a gorgeous tree silhouette gives me a feeling of peace. The fact that they are also some of the easiest natural things to recreate makes them one of my favorite subjects to paint. 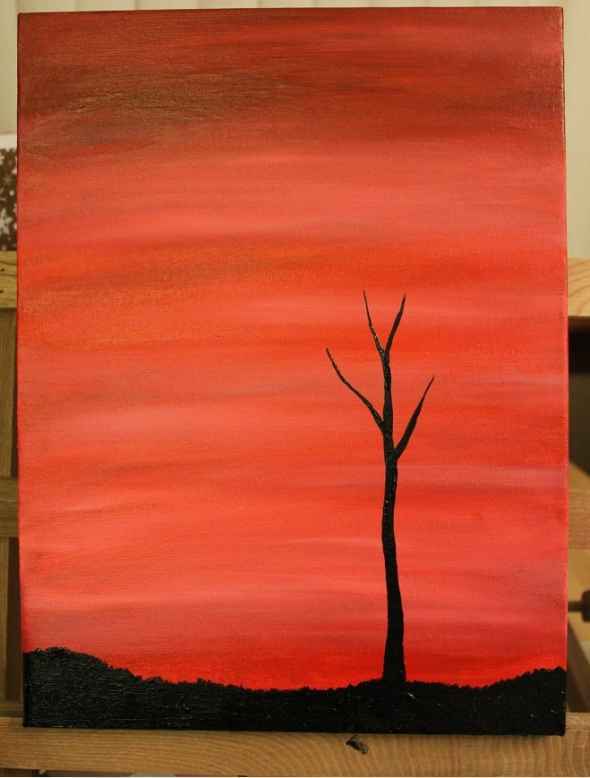 Painting tree silhouettes is slightly more challenging than drawing, however I find the experience to be therapeutic and very much worth any effort involved because the end product is striking and beautiful. Something to be proud of every time. 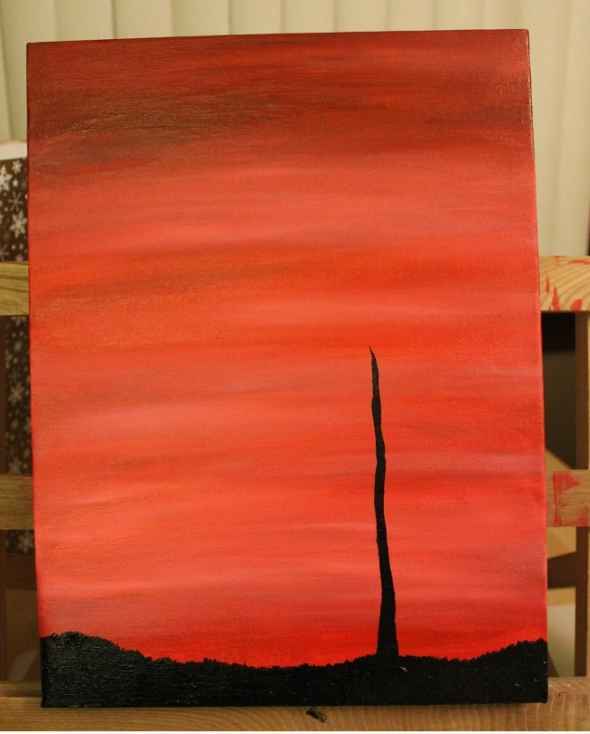 Below I will explain the process that I use in detail to paint bare tree silhouettes with pictures outlining each step. Stretched Canvas-This is a canvas, stretched over a wooden frame that you can just hang up on a nail so there is basically no need for an additional frame. They are lots of fun to play with, however if you have only ever painted on watercolor or acrylic paper previously it may take you a little while to get used to the new texture and the way that it eats your paint.The Canvas that I use in this page is 30 x 40 cm. 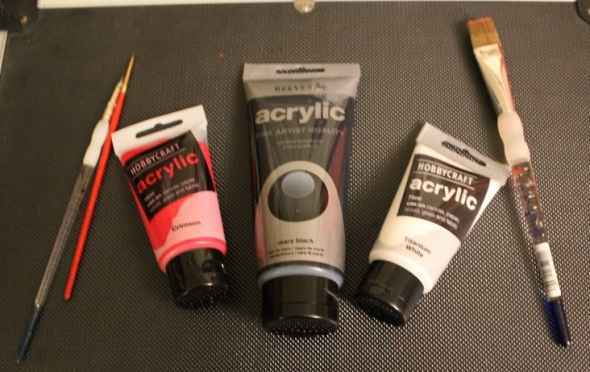 Acrylic Paint- Acrylic paint comes in tubes sold individually and in sets. It is water based and it can behave similarly to oils or watercolors depending on how it is used (glopped on or watered down). I am in no way shape or form an acrylics expert but it has become my paint of choice in the last few years. Acrylics dry very quickly and do not rehydrate.As with any medium, you can get ideas from other artists on how to use it but you will develop your own style with experience and that comes with practice. Micron Pens- Micron pens are basically felt tipped pens that draw over dried acrylic paint really well and they are fabulous when used for very fine detail work. They are utilized in a wide variety of arts and crafts however they are most popular when used for illustration because they make perfect lines that do not bleed or fade. They were recommended to me by a very experienced professional artist. I was a bit apprehensive at first but now, I wouldn’t be without them. Buying a set of these pens from a craft store or Amazon can be pretty extortionate so I buy all of my pens from eBay where I can always find a bargain. 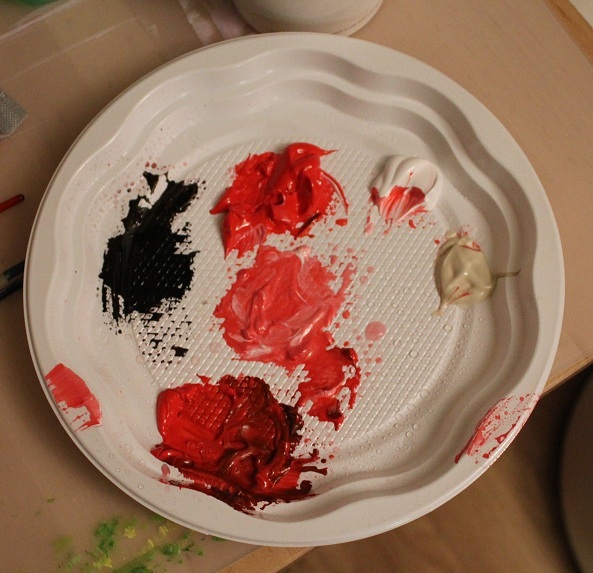 Palate- I use disposable plastic plates for my acrylics. Cheap and efficient. I also keep a spray bottle on hand to keep the paint moist if I am working over a long period of time because once they dry, they do not re-hydrate. You can also buy tear away plastic ones. To be honest I wouldn’t use any palate that wasn’t disposable for my acrylics, once they’re dry, they’re solid. Paper Towels- Pretty self explanatory here. Paper towels are not essential but they are extremely useful for drying your brush on and mopping up extra paint so I would strongly recommend that you have a roll on hand before you start painting. Water- Another self explanatory element of painting but worth mentioning because if you’ve never used acrylics before you need to be told that you need a nice big bowl or glass of water for rinsing and thinning paint. It is also preferable to have a dedicated water vessel that you use only for painting. 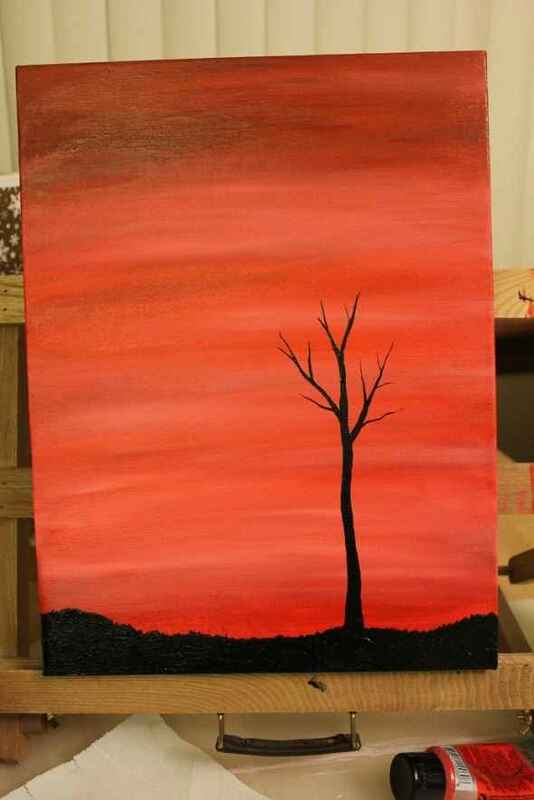 The first thing that you need to do, is establish a background on which to later place the silhouetted tree. What I did in my painting was I mixed some red paint with some black paint and some white paint and I just spread it back and forth combing highlights in while trying to keep the paint a relatively smooth texture bearing in mind that I would be adding delicate branches later which isn’t very easy on lumps and bumps. 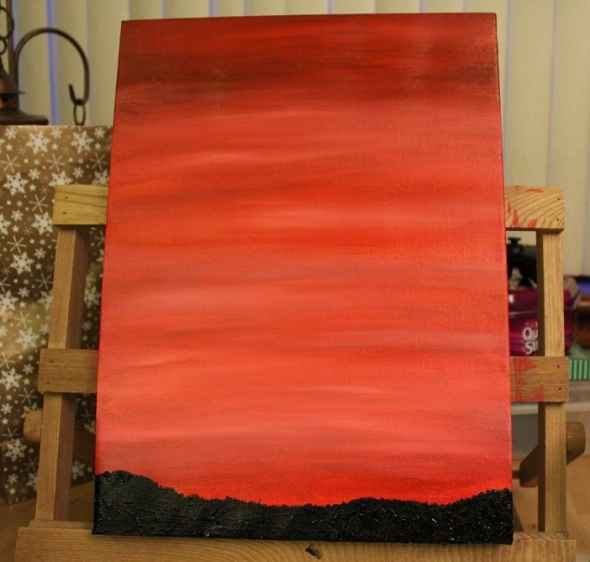 I painted the entire canvas, sides top and bottom. It actually took me a few days because I could only work on it at night and then I kept changing my mind about where I wanted the highlights to be. Just be careful not to make your background too dark or some of that beautiful contrast that you achieve with a silhouette will be lost. Acrylics are very forgiving. if you don’t like the way it looks once the paint is dry, paint right on over it. keep adding layers until you’re happy! After the background is established paint the bottom black and uneven. I laid the paint on very thick here using my brush to create a texture of peaks to simulate the rough and uneven ground. I then feathered up the top to represent grass. As a rule, using black in painting is usually a no no. “It creates a HOLE in your paper!” my art teacher used to tell me and when used carelessly, yes, this is exactly what it does. Having said that I love using blackest black for my silhouettes because it slices a striking, intricate and delicate pattern in the paper or canvas that I find beautifully captivating. If you prefer not to use black however, you can always just use a very darkened version of whatever other colors you’re using. 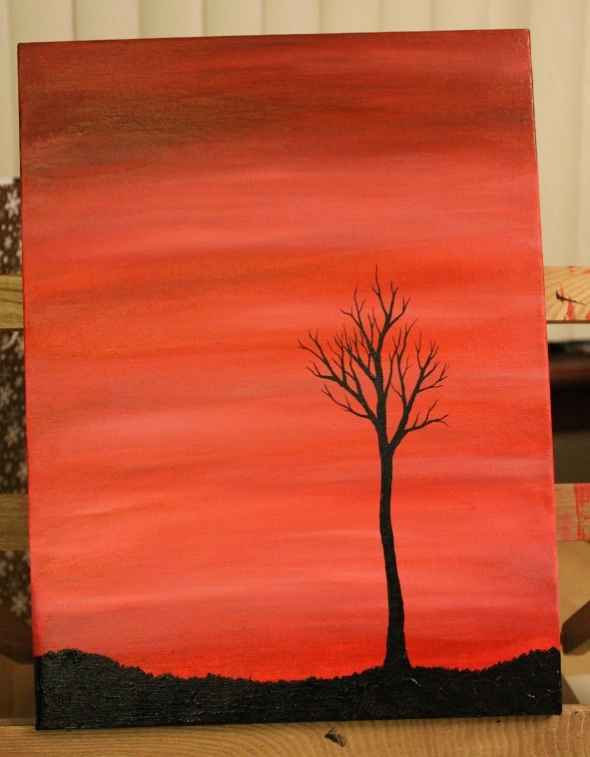 PLEASE NOTE: I have previously said that acrylics are forgiving, and they are, however painting a purely black tree on your background is not going to be easy to paint over if you mess up, so proceed with caution. Now it’s time to paint your tree trunk. Start thin and add to the sides to fatten it up to a size and shape that is suited to the style of tree you aim to create. I always make my trunks a little wobbly to make them more realistic. The primary branches are the supporting branches which will bear the weight of all following branches. Don’t paint too many and be sure to make them irregular in their spacing but balanced. Also think of how tree branches grow. they’re always reaching up toward the sun and they follow the sun as they grow over years. this makes them slightly knobbly and twisted and always form graceful V’s. 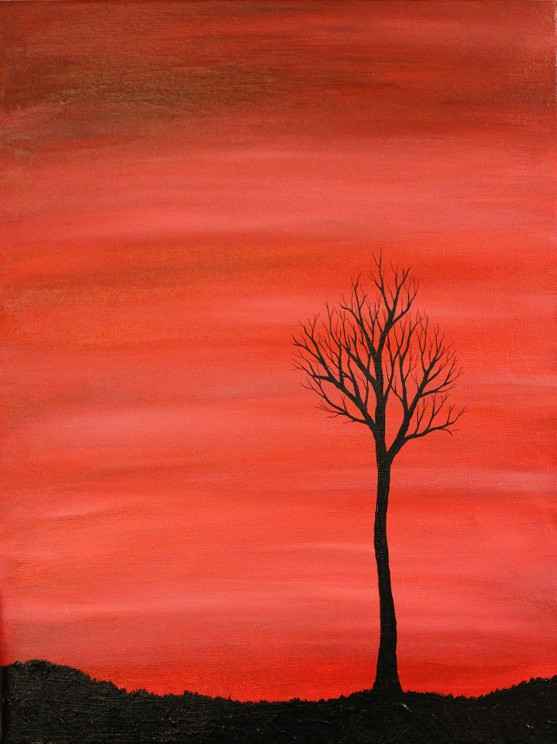 For branches I start to work horizontally, that is, the canvas goes into my lap. It’s too easy to make a wobble when working with a easel vertically. It is a good idea to allow these to dry completely before you continue. Next it’s time to start using that super fine brush to create secondary branches. Secondary branches operate on the same principle as the primary branches, they will support the weight of the next set of twigs. They are reaching toward the sun, they are bumpy and knobbly and you can perfect them and work back on them as you go to balance them out and fix any thick or thin spots that you might have made the first time around. Step away from the painting and come back to it a couple of times before you decide that it’s time to move on. Allow to dry completely before moving on. The branches are now getting quite small. There will be many tertiary branches and they will start to cross over. Same again as the previous ones… just let them grow up and multiply and maintain a balance. I find it really helpful to do this work with the canvas upside down so that I can drag my brush from fat to thin. Allow to dry completely before adding the incredibly maddeningly fine detail branches. This is the point at which I like to ditch the paintbrush and pick up my micron pen. You can also of course paint these but it’s an extremely tedious process by comparison. It is especially important that all of the other paint is dry before you proceed here if you’re using the pen because getting the tip in some gummy paint could completely destroy the pen. Always take pride in your work!